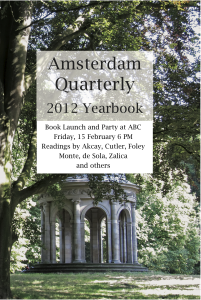 Amsterdam Quarterly, (AQ) an online and print, English-language, literary magazine, will celebrate the publication of its 2012 print-on-demand yearbook on Friday, 15 February at 6 PM at the American Book Center in Amsterdam. Come to the party and meet Amsterdam Quarterly’s writers, editors and publisher. The launch will include short readings by Iclal Akcay, Juliet Cutler, Kate Foley, Bryan Monte, Susan de Sola and Antonije Nino Zalica among others. AQ’s mission is to publish, promote and comment on English-language literature written in Amsterdam, the Netherlands and the rest of the world. AQ publishes online in the spring, summer and autumn at www.amsterdamquarterly.nl. In the winter it prints an annual anthology known in the Dutch tradition as a jaarboek or yearbook. AQ6, the next online publication, will appear in April 2012. Its theme is ekphrasis and it will feature poetry, essays, reviews and videos about art, architecture, dance and music as well as an interview with The Huffington Post contributor and former CBS News Paris correspondent, Joan Z. Shore. AQ7’s theme is health and wellness. The reading period for AQ7 is the month of April 2013. Send submissions or enquires to submissions@amsterdamquarterly.nl. Copies of the Amsterdam Quarterly 2012 Yearbook will be printed during the party to demonstrate the ABC’s Espresso Book Machine (EBM). An ABC staffperson will also be on hand to answer questions about the EBM.